The Houston Texans visit the Indianapolis Colts in Week 17 of the 2017 NFL season. PFF previews the top player matchups of the game. QB T.J. Yates vs. 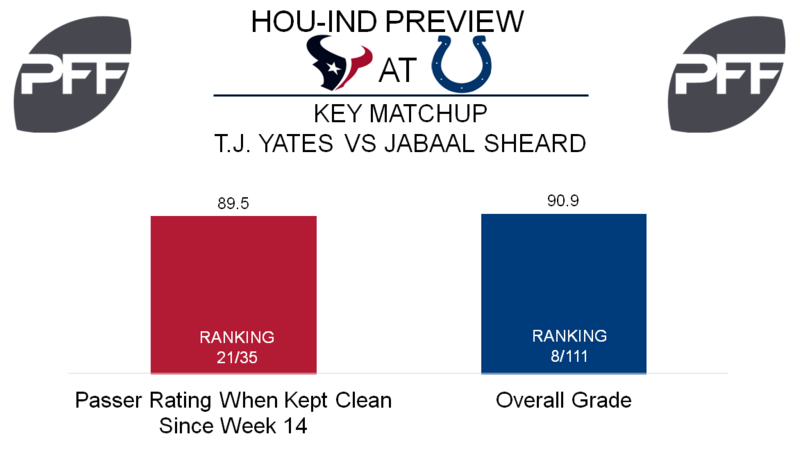 Edge Jabaal Sheard – Since he first saw action in Week 14, Yates has been pressured on 44.3 percent of his dropbacks, the third-highest rate among quarterbacks in that span. With a passer rating of 30.9 under duress, Yates ranks 32nd out of 35 eligible quarterbacks the past three weeks. When given a clean pocket, Yates has produced a more serviceable passer rating of 89.5. Sheard is having his best season to date with an overall grade of 90.9 that’s eighth among edge defenders. His pass-rush productivity of 11.6 ranks 17th among qualifiers, while he also checks in 13th with 63 quarterback pressures. These games for Yates are auditions for teams around the league, and working from a clean pocket would certainly help his cause. WR Will Fuller vs. CB Kenny Moore II – With DeAndre Hopkins expected to sit this one out, Fuller is expected to see an expanded role. Since returning from injury three weeks ago, Fuller has averaged just 0.77 yards per route run and despite his big play potential has only had one target that traveled 20-plus yards in that span. If his role doesn’t change due to Hopkins’ absence, he figures to line up against Moore on the right side. Over the past four games where he has seen extensive snaps, Moore has allowed 1.82 yards per coverage snap and a reception once every 8.8 snaps in coverage. He has shown improvement over the past two games though, where he has allowed a passer rating of 46.9 when targeted. With Moore’s recent improvement it will be interesting to see if he Fuller can end his second season on a high note. RB Alfred Blue vs. DI Johnathan Hankins– Over the past two games, Blue has played 60 snaps compared to Lamar Miller’s 47. One reason could be due to 85 of Blue’s rushing yards over the past two weeks coming before initial contact. Now Blue will face off with Hankins, whose grade of 90.0 in run defense is fourth among interior defenders. Hankins’ 347 snaps in run defense are the most of any interior defender, which could be why his run-stop percentage of 8.4 checks in 39th, despite his 29 stops being the seventh most. If the Texans build a lead, Blue’s will see an increase in volume but how he fairs against Hankins likely determines his success. 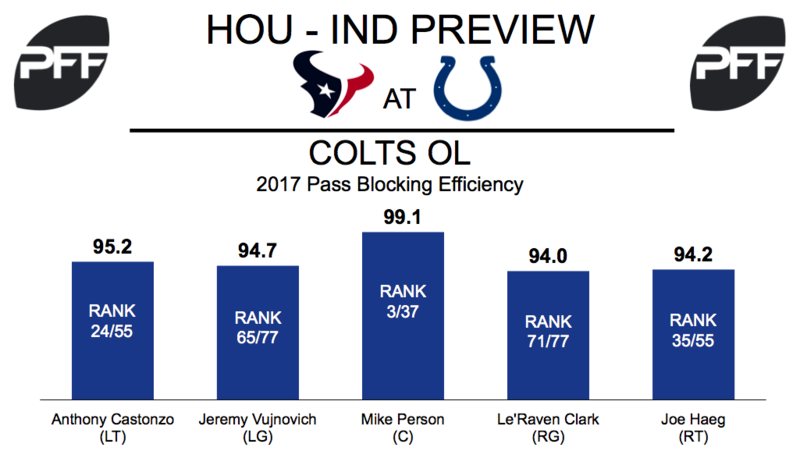 Colts offensive line vs. Texans pass-rush – Indianapolis’ offensive line has disappointed in 2017 and will be a factor in the team’s final game of the year against the Texans. On a positive note, Mike Person has filled in admirably after Ryan Kelly was placed on injured reserve. The center has not surrendered a pressure in his three starts with the Colts. The rest of the interior offensive line has not been as effective. Both Le’Raven Clark and Jeremy Vujnovich rank inside the bottom twelve at their position in terms of pass-blocking efficiency. At tackle, Anthony Castonzo leads the team with an 81.8 grade, ranking 13th overall. As a unit, the Colts rank 27th in the NFL with a 75.4 pass-blocking efficiency grade. For Houston, Jadeveon Clowney will lead the charge on the edge. Clowney’s 10.3 pass-rush productivity and 61 total pressures lead the team. The team’s defensive interior has produced lackluster pass-rushing options in 2017, but fourth-round pick Carlos Watkins has accumulated four pressures in his last three games. WR T.Y. Hilton vs. CB Johnathan Joseph – Hilton had a solid game last week against a strong Ravens secondary. He caught six of his 12 targets for 100 yards. The 100-yard effort was just Hilton’s fourth of the season, and his first in six games. In a largely disappointing year, Hilton is still averaging 1.81 yards per route run, which is 14th best at his position. On the other side, Johnathan Joseph has earned a 76.6 overall grade while averaging 11.6 coverage snaps per reception (36th among cornerbacks). When the two teams met in Week 9, Hilton burned the Texans for 175 yards on just five catches, including a 45-yard touchdown reception against Joseph. TE Jack Doyle vs. LB Zach Cunningham – Doyle had a strong showing in the Colts’ penultimate game last Saturday against Baltimore. The tight end hauled in five catches off of seven targets and earned 28 of his 41 yards after the catch. His 86.1 overall grade was the best among Indianapolis’ offensive players and third-best at his position in Week 16. In the teams’ Week 9 matchup, Doyle was targeted on nine passes, logging eight receptions and 63 yards. A second-round selection, Cunningham has turned in a solid rookie year for Houston. His 79.9 overall grade is second-best among rookie linebackers and the former Vanderbilt Commodore has accumulated 14 stops over his last three games. In his last three games matching up against tight ends, Cunningham has allowed two receptions on three targets for 19 yards.